If you have suffered a shoulder injury, you have probably injured your shoulder ligaments. The ligaments of the shoulder help to hold the humerus in the socket, and to provide stability to the joint. The shoulder joint capsule is often injured in sports, especially with dislocations and shoulder sprains. Here we will look closer at shoulder anatomy, focusing on the ligaments and joint capsule. 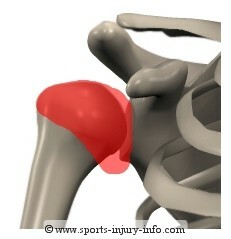 The shoulder ligaments are not seperate from the joint capsule. In fact, they aren't really ligaments at all, in the way you think about ligaments like the ACL or PCL in the knee. They are simply areas of tissue that are thicker than the other portions of the capsule. So, your physician may refer to the shoulder ligaments as part of the capsule, or as ligaments, but they mean the same thing. The shoulder has 3 different areas of thickening in the capsule, which can be referred to as ligaments. These are the anterior glenohumeral ligament, inferior glenohumeral ligament, and posterior glenohumeral ligament. The ligaments provide stability to the joint, and help to restict excessive joint motion. Notice in the picture how the inferior ligament (or capsule) seems to hang down from the humerus. This is important as we talk about shoulder function. The anterior shoulder capsule helps to restrict forward motion of the humerus. It also helps to restrict external rotation. As will all ligaments and joint capsules, the shoulder ligaments all become tight with different motions. 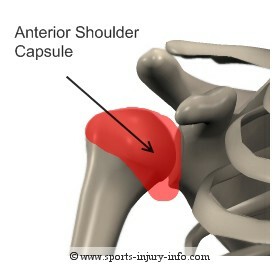 The anterior capsule becomes tight when the shoulder is flexed above 90 degrees, or when it is externally rotated. The anterior glenohumeral ligament is the tissue that is injured with 95% of all shoulder dislocations. When the shoulder dislocates, it almost always comes forward and down. This stretches and tears the anterior part of the joint capsule, and the anterior glenohumeral ligament. The most common position for shoulder dislocation is when the arm is out to the side, above shoulder level, and the elbow bent to 90 degrees. In this position, the anterior capsule and ligament is tight...forced motion in this position will significantly stress the capsule, and can cause damage. 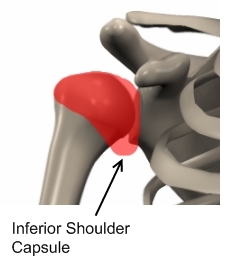 The inferior glenohumeral ligament is a redundency of the shoulder capsule. In the picture you can see how it hangs down from the humerus...almost like there is too much tissue there. This isn't the case. You see, when the shoulder moves, the capsule must be able to stretch and adapt. If the inferior capsule was not hanging down, you wouldn't be able to raise your arm over your head. When the arm is raised above shoulder level, the inferior capsule begins to tighten. The inferior capsule is not usually injured during sports...however, it can become excessively tight if the arm is immobilized for an extended period. Ever heard of frozen shoulder? This is the part of the capsule that often tightens down and causes frozen shoulder. The posterior shoulder ligaments, or the posterior glenohumeral ligament, help to prevent excessive internal rotation of the shoulder, and excessive shoulder flexion. It is not usually injured during sports, because most dislocations occur anteriorly. However, it can cause problems when it gets tight. This is very true with overhead throwers. Pitchers often have a very tight posterior capsule, and this can contribute to injuries such as shoulder impingement syndrome. The shoulder ligaments and joint capsule play an important role in shoulder stability and function. They provide the necessary restrictions to excessive motion. While the vast majority of sports injuries involve the anterior portion of the capsule, the posterior capsule can be involved with injuries like impingement syndrome.